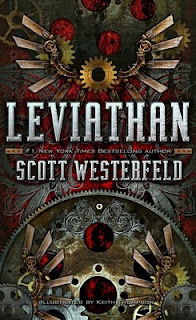 Leviathan, with its attractive cover and fantastical elements, has introduced me to the steampunk genre—one I have been wanting to explore for some time now. When I began reading, I had to shift gears from what I am accustomed, but once I adjusted the story finally took off for me. In 1914, when Archduke Franz Ferdinand and his wife are assassinated, Germany declares war on Austria, and Prince Aleksander, the archduke's son is now on the run. He is accompanied by four of his father's loyal men, among them Count Volger, as they make their escape in a Stormwalker, a steam-driven iron machine with legs. Back in England, Deryn Sharp, a fifteen year old girl, disguises herself as a boy to join the British Air Service. Her late father had taught her about aeronautics and flying in a hot-air balloon. 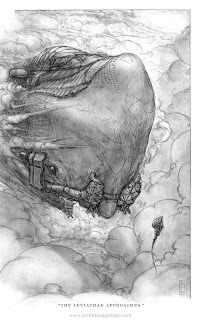 She is a tomboy and fearless, finally ending up on the Leviathan, a whale airship that is part of the British fleet. Alek and Deryn's stories are told alternatively until they meet a little more than halfway into the book. I have to admit I plodded through the first 75 pages. I guess I wanted the plot to move along but perhaps the author felt the need to give the reader a better picture of the world in Leviathan. Because it's a novel of alternate history, there are invented creatures and mechanisms that clearly were not possible when the first World War took place, adding a novel and fantastical element to the story. The British Darwanists used fabricated animals as their weaponry, such as the Leviathan, a mammoth whale airship, the Huxley, a giant squid that functioned much like a hot-air balloon but using hydrogen produced by the beast itself, fléchette bats and so forth. This is based on the fact that Darwin, whom they considered a great scientist also discovered “life threads” or DNA and so they could now fabricate these strange beasts. The Austro-Hungarians and the Germans, on the other hand, used machinery known as Clankers. And all this during a time of aristocracy and bowler hats. Yeah, it took some getting used to, but this is what steampunk is all about. I liked both the characters of Alek and Deryn, although I found Deryn's could have been developed more. She is involved in a lot of action, but I wanted to know more about her as a person versus her actions as a soldier. She was afraid of being discovered but this did not come through so much. She was shown to be smart, tough and quick to save the crew several times. 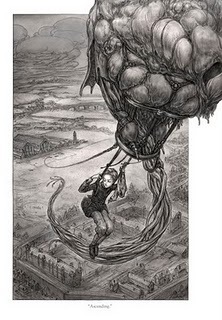 Some things were unrealistic, though, like when she easily bounced back after surviving the airship's crash, smashing her head on the ice, experiencing hunger and bitter cold, working with the crew to get the ship back in the air, and getting next to no rest. For a skinny slip of a girl she was inexhaustible. I also couldn't help wondering how she dealt with her menstrual cycle on a ship full of men and without the advent of modern tampons! The story became interesting when Dr. Barlow, a scientist came on board the Leviathan and is on a secret mission. She was one of the most interesting characters in the story for me, and her actions and witty dialogue built suspense as to what was the precious cargo she carried. Alek and Deryn form a close bond although he still has no idea she is a girl. I sensed a hint of a possible future romance. It will be interesting to see how they deal with their very diverse backgrounds, he of royal blood and she a working class commoner. The black and white illlustrations are fantastic and truly suit the story's mood. They helped me visualize much of the action and strange creatures, especially the Leviathan. I kept seeing the story like a black and white movie and it reminded me of the movie Sky Captain and the World of Tomorrow. Since this book was written for a YA audience, I also appreciated that the battle scenes weren't gory at all, just action-packed and thrilling. Also, I had to smile at the language used. Just like the invented creatures, expressions such as “Barking spiders!” or “Blisters!” and “Don't be daft, you bum-rag!” were considered swearing. Kudos to the author for keeping it clean throughout. After several close battle escapes for both Alek and the crew on the Leviathan, they are on their way toward the Ottoman Empire when the book ends. 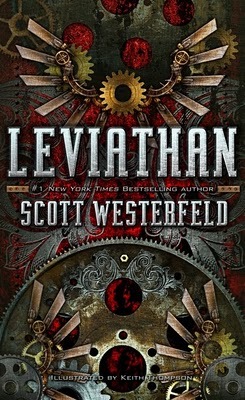 Obviously, Leviathan is the first book in a trilogy and I shall have to read Behemoth to find out what happens to Alek, Deryn, Dr. Barlow and Count Volger. My husband enjoyed this but hasn't bugged me to get Behemoth yet. It sounds like I should give it a try. I have heard so many wonderful things about this book. It does sound intriguing!